There comes a day and age where many young boys make the biggest decision of their young life. One day they up and choose a favorite NFL team and then stick by them through thick and thin. Maybe you already have a pretty good idea of what team they’ll choose. Well, if you know that you’re going to have a Dolphins fan on your hands then we have the perfect gift! Take a look at this awesome NFL Dolphins Uniform Costume. It will be perfect for your little all-star to reenact his favorite plays in the backyard. With enough practice, who knows, maybe he’ll put himself on track to be a football legend! Maybe your little one just wants to dress up as his favorite player for Halloween this year. Well, with the iron-on numbers and the blank back on the jersey, that can easily be accomplished. No matter who his favorite running back or wide receiver is, (or maybe he’s more into the defensive end of the team) you can effortlessly complete his transformation with the magic of an iron. Now before you let your little one storm the field or run into the streets for Halloween, make sure you teach him a thing or two about being a champion. Remind him that winners go until the whistle and never quit with time on the clock. 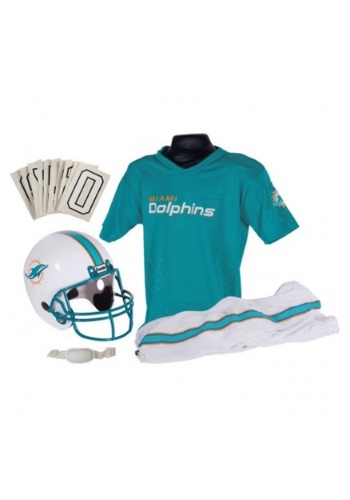 Make the game winning play this year and give your kiddo the ultimate gift when you grab this NFL Dolphins Uniform Costume! Snap his chin strap to his helmet and let your mini-MVP march out onto his field of dreams. My son has been so excited to receive this costume, unfortunately it came with the new logo- not the old one that is seen on this website. That was a bit disappointing but the costume looks great other wise! I purchased this for my 3 year old nephew because he wanted to be a football player for Halloween! It came exactly as described with the new dolphin logo. Needless to say he was very excited and happy.